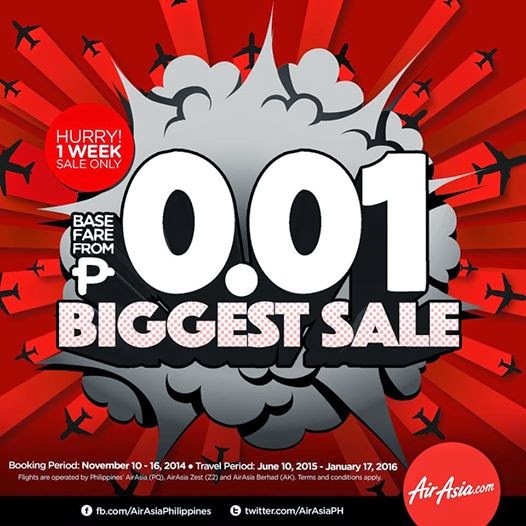 AirAsia Zest announces Php 0.01 Seat Sale for selected domestic and international destinations. Fly to Kalibo, Cebu, Palawan, China, and Malaysia with an almost zero fare. The company is the Filipino Low Cost Carrier that flies hand in hand with AirAsia, the world’s best low cost airline for six consecutive years. Promo seats are available for booking today at www.airasia.com until 16th November 2014, for the travel period from 10th June 2015 – 17th Jan 2016. All-in promo seats (with airport tax, fuel surcharge and other applicable fees) from Manila to Kalibo (Boracay), Tagbilaran (Bohol), Puerto Princesa (Palawan), Cebu, Tacloban* and Cebu to Davao, Cagayan de Oro are available from as low as P353.81, one way while international flights from Manila, Cebu, Clark, Kalibo to South Korea (Incheon/Seoul and Busan), Malaysia (Kuala Lumpur and Kota Kinabalu), China (Macau and Shanghai) and many more starts from as low as P750.00, all-in, one way only. AirAsia Group is also offering promo seats to various domestic & international destinations such as Langkawi, Yogyakarta, Krabi, Siem Reap, Kalibo (gateway to Boracay), Da Nang, Surat Thani (gateway to Koh Samui), Chengdu, Perth and many more destinations from Kuala Lumpur; along with other exciting destinations from AirAsia’s other hubs in Penang, Johor Bahru, Kota Kinabalu and Kuching. The Free Seats (excluding airport tax, fuel surcharge and other applicable fees) are available for booking at www.airasia.com today until 16th November 2014, for the travel period from 10th June 2015 – 17th Jan 2016. “Furthermore, we also have an enhanced list of Fly-Thru city pairs which will enable seamless connectivity for our guests. There are currently 858 Fly-Thru city pairs which AirAsia & AirAsia X guests can take advantage of during this Free Seats promotion,” added Siegtraund Teh. The Free Seats promotion is available online at www.airasia.com and also via AirAsia’s mobile apps on iPhone and Android devices, and also AirAsia’s mobile site at mobile.airasia.com. Just search AirAsia on the respective app stores to download and start booking! AirAsiaGo, the holiday division of the world’s best low cost airline, will also be offering special deals for travellers during this promo. AirAsiaGo is presenting great savings up to 60% when Free Seats are booked together with hotel accommodation. Prices are from as low as RM149 for both flight and accommodation (per person). For those looking for accommodation only, grab it from as low as RM59 per night. For more information and to book, visit its website at www.AirAsiaGo.com. The same promo booking period and travel period applies. Be a BIG Shot under the AirAsia BIG Loyalty Programme and earn BIG Points to redeem free AirAsia flights! BIG Shots can also opt for BIG Points & cash redemption to redeem flights, with only a minimum of 500 BIG Points. For more information, please visit www.airasiaBIG.com. Keep updated with AirAsia’s latest promotions and activities via Twitter (twitter.com/AirAsia) and Facebook (facebook.com/AirAsia).